4PCD four-tooth roller crusher (adjustable tooth center distance) is a series of crushing equipment designed and developed by our company for the fluidized bed boiler power plant and washing plant. It can be used in metallurgy, chemical, mining, building materials and other industries. Non-metallic materials with a compressive strength of 50-110 MPa. It is especially suitable for all kinds of raw coal suitable for crushing clean coal, lignite and coal gangue not exceeding 70%. 2. The special model of the power plant ensures that the discharge granularity <10mm accounts for more than 90%. 3. The equipment rack is a quick-disconnect structure for box-type welding, which effectively reduces equipment maintenance costs. 4, alloy steel material tooth plate, the surface covered with surfacing wear layer, to ensure a long life of 6000 hours. 5. The tooth plate is embedded with the split tooth plate, which can greatly reduce the replacement time. 6, less noise, less vibration, less dust, low power consumption, adjustable discharge size, small footprint, and simple maintenance. 7. 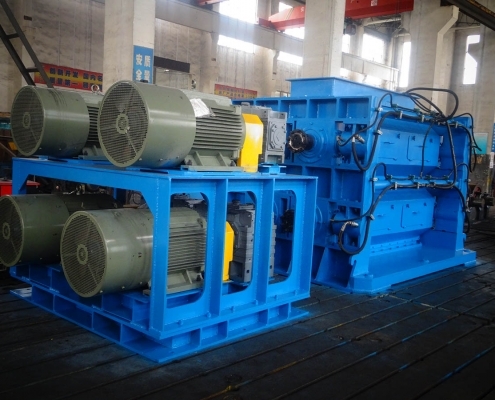 The hydraulic automatic retracting device and the debris removing device can effectively prevent the damage of the non-ferrous alloy block and the hard rock to the toothed roller and the damage of the wooden block and the flexible object to the normal operation of the toothed roller.